This week has been a little stressful to say the least. Baby is unwell at the moment and consequently has been very unsettled. The Doctor has done various tests and has now referred her to the paediatrician to try and get to the bottom of what is going on. On top of this she came down with a stinking cold a few days ago and decided not to eat anything. She spent the majority of yesterday crying and although a little better today, we have had our moments. 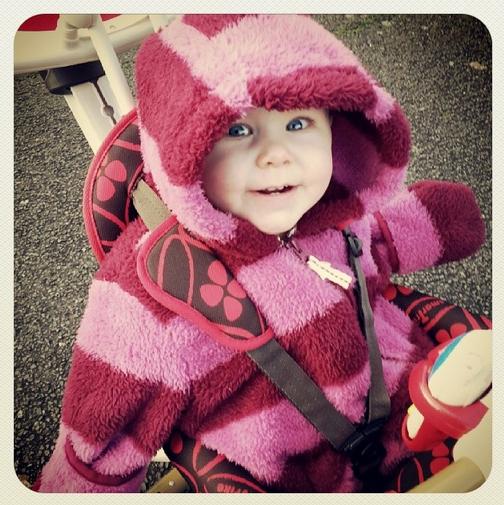 Today Baby decided she didn’t want to nap and so I bundled her up and popped her in her bike. It was nice that she was feeling well enough for me to take her out. I harnessed up the furries (Lily and Lou Lou) and we braved the cold for a little jaunt round the block. This was the first time I have taken Baby, bike and furries out together on my own. 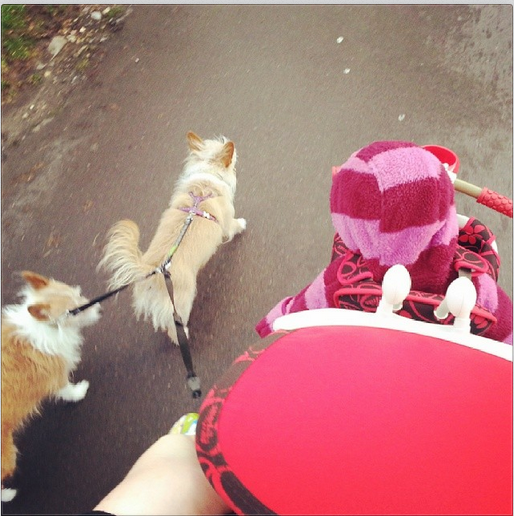 A silly thing, but when I was pregnant I imagined taking long walks with my new baby and my little dogs. I should say at this point that it is not always relaxing walking my little rescued cherubs. The mummy dog is fear aggressive, as she was attacked before I rescued her and the baby dog (almost 5 so not really a baby) just joins in! They are all bluster, but they do make a lot of noise. 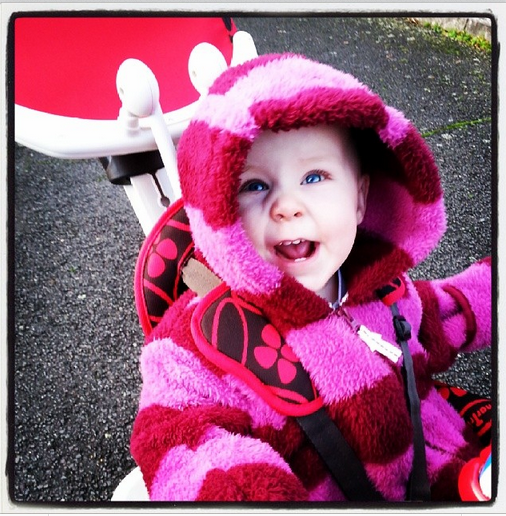 Also trying to co-ordinate 2 retractable leads and a buggy was impossible. However, we recently bought a little coupling to link the two dogs together and Baby’s bike is very easy to steer with one hand, so off we went!. In the madness and stress that has been this week, this was a special moment, an ordinary moment, but a special one nonetheless.